(Black Earth, WI) Burt Avedon and Susan Colby have reinvented the iconic Willis & Geiger All-Terrain Bearer’s Shirt. The original Willis & Geiger design was inspired by the patches hand-sewn to the shoulders of shirts worn by the men who packed in supplies on African safaris. Those patches helped ease the burden of the heavy loads they carried into the bush. The reinvented Avedon & Colby Bearer’s Shirt retains the Willis & Geiger’s seamless shoulder yoke that prevents chafing when carrying a pack or rucksack – and adds a slew of new performance and comfort features. 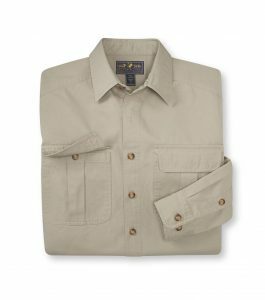 Finely tailored in Hong Kong from 7 oz., 100% cotton canvas by a long-time manufacturing partner from Burt and Susan’s Willis & Geiger days, the new All-Terrain Bearer’s Shirt is as stylish looking as it is functional, making it the ultimate shirt for wearing in camp or on the trail. Side Panel Construction (an Avedon & Colby Signature Feature): Tailored side panels replace traditional side seams (which are cheaper to sew) to separate the front and back shirt panels and prevent transfer of torque so the shirt does not twist or pull when climbing, crawling or pulling. Double-Reverse Underarm Gussets (a Signature Feature): Avedon & Colby’s unique underarm gusset design allows for complete freedom of arm movement by preventing any pulling on the shirt’s sleeve when arms are raised or rotated. Articulated Elbows (a Signature Feature): A sequence of small pleats at the elbows help prevent the shirt cuffs from pulling back and binding when bending arms. Sleeve Roll Tabs: Extra-long sleeve roll tab loops are hidden inside each sleeve to accommodate rolling up shirtsleeves without binding at the cuffs. Genuine Bellows Pockets: Generous and functional (not decorative) box pleats on each pocket allow for expanded capacity. Tuck-In Pocket Flaps (a Signature Feature): Both front pocket flaps are designed with unique side notches to tuck into the open pockets without puckering for a neat appearance and to prevent snagging. Center Back Hanger Loop: The sturdy canvas hanger loop is securely stitched so it won’t pull out. Available in Men’s S – 2XL and L & XL Tall in traditional khaki and retailing for $179, the new All-Terrain Bearer’s Shirt can be ordered on the Avedon & Colby website: www.avedoncolby.com. Burt Avedon: Burt purchased the original Willis & Geiger in 1978 after it went bankrupt following the collapse of Abercrombie & Fitch, the company’s largest customer. After a distinguished career as a decorated Navy fighter pilot serving in combat during both World War II and Korea – and later as a Top Gun instructor and a bush pilot/professional hunter in British East Africa, Burt set about to revive the bankrupt company by re-introducing improved and entirely new versions of many of the iconic Willis & Geiger styles that had so capably outfitted adventurers and explorers like Teddy Roosevelt, Ernest Hemingway, Charles Lindbergh, and Amelia Earhart. When Land’s End closed Willis & Geiger in 1999 during a company-wide downsizing, Burt and Susan Colby launched their design and consulting firm, Avedon & Colby, to create premium performance wear and accessories for leading outdoor and lifestyle brands. Susan Colby: Susan joined Burt at Willis & Geiger in 1986 with an art degree from Smith College and a successful career with Westinghouse’s Design Center, Associated Merchandising Corporation, and as a designer and buyer at Paul Stuart/NYC. Together, Burt and Susan designed garments and accessories for Willis & Geiger that blended the classic good taste of a bygone era of wilderness exploration with quality and performance features never before seen by outdoor enthusiasts. They continued this tradition after the close of Willis & Geiger, designing premium-performance clothing and accessories for leading outdoor and lifestyle brands like Orvis, Beretta, Woolrich, King Ranch, Kevin’s and Eddie Bauer.